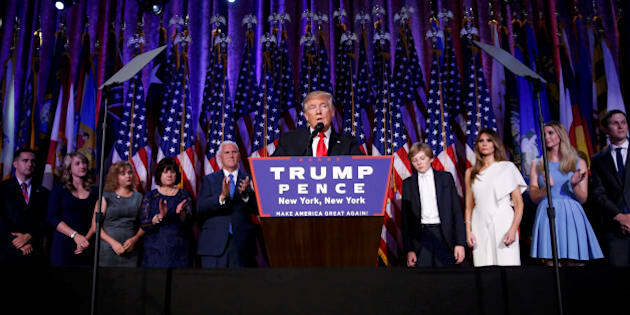 As I rose before sunrise on Wednesday morning to the cries of my youngest daughter, who is 16 months old, my first thoughts were of Donald Trump, the president-elect of the United States of America. I held her in my arms to quiet her wails, and wondered what I would say to my nine-year-old daughter, and to my seven-year-old daughter, when they woke up. I thought about their innocence that is slowly making way for the hard realizations of the world, and my heart broke for the loss of that innocence. Then, I thought about my three-year-old daughter, and how she is full of fire and strength and ambition, and wondered what this world has in store for her, and whether she has the resilience to withstand it. The one question that I asked myself, again and again, was this: How do I explain to these children how a man who has openly bragged about sexually assaulting women has become the president-elect of the United States of America? If they were a little older, I would tell them exactly how and why it happens. A little more than a decade ago, a male Member of Parliament rammed his tongue into my ear in a committee room full of cameras, politicians, staffers, and committee witnesses. He had pretended that he needed to whisper something of importance to me, and gestured to put my face next to his. First whispering some nonsense, he stuck his tongue as far down my ear as he could manage. He did it because he knew he could count on me to keep my mouth shut. And what did I do? I will tell you: nothing. I didn't speak out. I didn't shout. I didn't slap his face, or leave the room. I didn't tell my boss about it. I didn't tell his party leader. Shocked and frozen, I simply walked back to my seat and carried on with my work. I don't think I even told my own husband about it until months afterward, almost as an afterthought. Had I drawn any attention to his actions, either at the time or afterward, what would everyone have said? She doesn't remember the words he whispered in her ear. Wouldn't someone else have noticed? Maybe she was flirting with him. Didn't you notice her flirting with that other MP once? Maybe she was flirting with him to further her career, and now she is trying to destroy a decent man with lies. If it had really happened, she would have told someone sooner. This man and I had never interacted in anything other than a professional manner previous to this incident. He never propositioned me, never asked me to dinner, never flirted. So why did he do what he did? There is only one answer: because he could. I did nothing, and I said nothing, because the system was stacked against me, and I knew it. A man who sticks his tongue in the ear of a woman in the workplace has not done it once; he has likely done so repeatedly and without consequences. And however many of us there are, we have each remained silent. I won't speak his name out of fear. Fear of retribution. Fear of not being believed. Fear of a smear campaign. Fear of lies to discredit me. Fear that my family will be attacked. Where is this man now? I have been told by well-meaning friends that if hint at where he is, even in the most general sense, journalists will hound me; people will make phone calls; I may be subject to personal investigations and attacks or even lawsuits; my family might be torn apart. Does he still sit in the highest echelons of political power? Or did he retire from politics to run the family farm? Either way, he is safe, while I still feel the consequences of his actions. And I still cannot name him, because people still will choose to believe him over me. This is how a man like Donald Trump gets elected. And that makes me want to weep for my daughters. Because more than anything else, the fact that a man like this one can so easily exploit his power gives a woman the sense that she is less than. That her sense of self, her sense of worth, her autonomy and control over her person is less important than any sense of embarrassment the man will feel at his own sleazy behaviour being exposed. By remaining silent, she puts herself second to him, his wife, his children, his career, the reputation of the party or the organization, even though she was just sitting there doing her job. As the dust settles on the U.S. election of 2016, we know that for every Donald Trump out there, there are hundreds more. And the more we tell our stories about these individuals, the less likely they will be to get away with it in the future. We cannot afford to be silent any longer. So, this is what I will tell my daughters when they come home from school today: The world is not a perfect place, but it is your destiny to work for justice and truth in this world. It is your destiny to take up your places alongside the powerful men and women who rule the world, to do good for others, to be agents of change, to be courageous and resilient. And most of all: Never stay silent in the face of wrongdoing. Stand up. Tell your stories. Speak the truth. Take all the space you need. And I will promise them solemnly to lead by example.